Forerunner 15 is so easy to use, you can start your run with the press of a button. 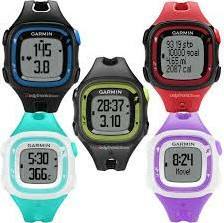 As you run, you can see your time and distance clearly displayed on one screen with calories and pace on another. You can also customize the settings to show pace and distance on the same screen. As you run, Forerunner 15 automatically alerts you when you complete each mile, giving you a friendly beep and a screen that flashes your time for that mile. When you complete your run and save it, you’ll see a summary of how you did, including your total time, distance, average pace and calories. The watch even lets you know when you achieve a personal record, such as your fastest mile or longest run to date. For runners who want a little more, Forerunner 15 has a couple of simple training features. Virtual Pacer™ compares your current running pace to your target. It also has a run/walk feature that’s helpful if you’re just starting out or your running plan includes walk breaks. With a simple connection to your computer, you can upload your runs to “Garmin Connect” to see your run on a map, get more detail on each mile and share it with friends — all for free. You’ll be even more motivated when you see your miles add up in Garmin Connect and can go back and see how you’ve improved from last week, last month or last year.